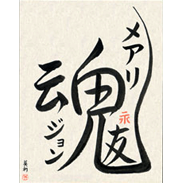 When you purchase a custom Japanese Calligraphy design from Takase Studios your imagination is truly the limit. Work directly with Master Japanese Calligrapher Eri Takase and create a unique work of art just for you that will last a lifetime. 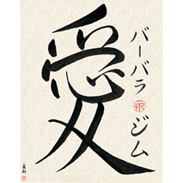 Designs can range from Zen phrases to Biblical passages to works of inspiration, encouragement, or love as a beautiful piece of Japanese wall art. Let your imagination guide you. When your custom order is placed, you will work directly with Master Japanese Calligrapher Eri Takase to create a unique work of art that is tailored to you and your taste. An interactive process is used where we work with you on the translation, font, and layout by showing you preliminary samples via email that are discussed and then changed as needed. These preliminary samples will not be computer fonts, but rather are hand-lettered designs created by Master Calligrapher Eri Takase to your specification. Takase Studios has both native-English and native-Japanese speaking translators, so you know the translation will be absolutely correct. Further, we provide you with dictionary references and work with you until you are completely comfortable with the design. By working together we create a unique work of Japanese wall art using a process that is both fun and informative. What is even better, most work can be completed in as little as a few days. If you are not sure about a design or would like to discuss a design before ordering, then please feel free to contact us. 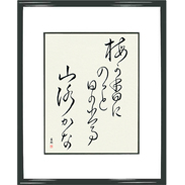 Work directly with Master Calligrapher Eri Takase to create a purely custom work. This beautiful 16 inches by 20 inches framed artwork arrives ready to display.